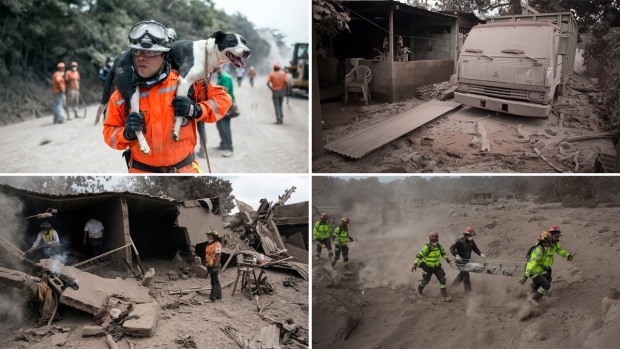 Rescuers suspended search and recovery efforts Thursday at villages devastated by the eruption of Guatemala's Volcano of Fire, leaving people with missing loved ones distraught and prompting some to do the risky work themselves with rudimentary tools. Conred, the national disaster agency, said climatic conditions and still-hot volcanic material was making it dangerous for rescuers, and it was also taking into account the fact that 72 hours had passed since Sunday's eruption. That's the window beyond which officials earlier said it would be extremely unlikely to find any survivors amid the ash, mud and other debris that buried homes up to their rooftops. "It rained very hard yesterday. ... 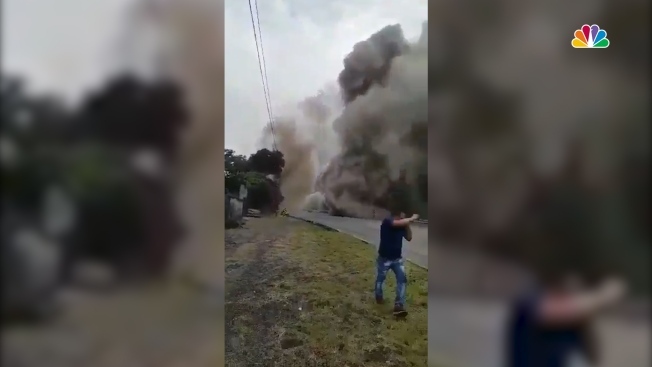 The soil is unstable," said Pablo Castillo, a spokesman for national police. Troublesome downpours and more volcanic activity had been hindering searches, but when teams have been able to work in the hardest hit areas, the death toll has continued to rise. It was officially still at 99 with nearly 200 more believed to be missing. Oscar Chavez trekked over a mountain with his father and younger brother to search for his brother Edgar, sister-in-law Sandra and nephew Josue in the hamlet of San Miguel Los Lotes, which was almost entirely wiped out by the volcanic flows. They have not been heard from since the eruption. "We looked for them in shelters, hospitals, everywhere, but we did not find them," said Chavez, 34, wiping a tear from his eye as the others used sticks and a machete to try to tear down a wall and the metal corrugated roof of a home. "So, better for us to come here." About 10 police officers saw what the family was doing and came to help, bringing more robust tools. At a shelter set up in a school in the nearby city of Escuintla, workers fastened colorful ID bracelets on the wrists of people who are among several thousand displaced by the eruption. Nohemi Ascon, 41, is the aunt of six children between the ages of 1 and 8 who died in Los Lotes. A photograph taken shortly after the disaster showed their bodies huddled together on a bed in the corner of a room, covered in white ash and blood. Ascon said other family members were still unaccounted for. "My father, my mother, my sisters are there," she said, upset over rescuers' decision to suspend their search. "It is their job. It is not right that they leave them there. They should get them out so we can take them to the cemetery." The United States announced it was sending emergency aid, including financial resources, to help meet food, water and sanitation needs. Washington also dispatched aircraft to help transport burn victims to Florida and Texas. Late Wednesday a U.S. Air Force C-17 carried six Guatemalan children who were badly burned for treatment at the Shriner's Hospital in Galveston, Texas. White House spokeswoman Sarah Huckabee Sanders offered "deepest condolences" to victims and said the aid was being provided at the request of the government of Guatemala. On Wednesday, a downpour forced rescue teams to retreat for fear of mudslides and boiling water flowing down the volcano's slopes from dangerously hot volcanic gas and ash. A day earlier, flows of super-heated volcanic material forced crews to pull back. In past disasters in which authorities determined there was no chance of finding survivors and further efforts to recover bodies would be too difficult, areas have been declared burial sites, the final resting place of the victims. Officials have not yet taken that step, however. Associated Press photojournalist Moises Castillo contributed to this report.